Camper air conditioners help to beat the heat and keep you comfortable during those hot, muggy summer days. With our great selection of Camper air conditioners by Carrier, we not only offer you the best product, but a well-known product as well. 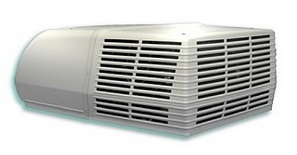 We offer both 13,500 BTU and 15,000 BTU air conditioners. You can get them for ducted and non-ducted campers, depending on which one you need. These units run quietly so as not to disturb you while you are resting or while driving. We carry all the accessories you need to make these Camper air conditioners work for you: filters, air conditioner covers, thermostats, ceiling assemblies, and more. With an air conditioner from Camper Parts World, you'll never need to sweat the heat again. Having a working air conditioner is important in your RV, especially if you travel in the summer months. Now you have a place to escape the heat with our Camper air conditioners. We carry high capacity; non-ducted; ducted; 13,500 and 15,000 BTU units, and ceiling assemblies. There is no need for you to go without proper A/C again. We have a huge selection of RV air conditioners and Camper air conditioner accessories. Whether you have a tow able camper or a motorhome, we have an air conditioner for you.